Update…..Tsunami reported in New Zealand……. CNN has reported that a Tsunami has occurred in New Zealand…and water is receding in Hawaii at this time…. That was one hour in the past from 4:45 EST Saturday afternoon…..
As of 4:57 EST ….water height has risen by 3 feet in Hawaii……..
For more info on live time viewing……..
Hawaiian authorities were rushing to evacuate up to 100,000 residents and tourists from low-lying coastal areas Saturday morning as an estimated 3-to-8-foot tsunami raced toward the islands at the speed of a jet plane. Radio stations were broadcasting civil defense alerts, and sirens sounded in the early-morning hours, well ahead of the expected arrival of the waves, estimated at about 11 a.m. Hawaii time, triggered by a massive earthquake in Chile. “We are taking this very seriously. We have activated, and we think this is a real emergency,” said Jane Lovell, spokeswoman for the civil defense agency on the island of Maui. Two hours before the expected arrival of the tsunami, Gov. Linda Lingle signed an emergency disaster proclamation, and said she was preparing to take a National Guard helicopter to survey any damage. “My overall impression is that the state is well-prepared,” she said. The Pacific Tsunami Warning Center issued a Pacific-wide warning. An advisory, the lowest level of notice, is in effect for most of the West Coast of the U.S., including Alaska. Hawaii was expected to be among the hardest hit. The U.S. Navy Pacific Fleet sent four warships and three other support and research vessels steaming out to sea as a precaution against damage near shore at Pearl Harbor. A fifth warship, the Port Royal, was in port for maintenance and unable to sail, so it was being towed into deeper waters, said fleet spokesman Capt. Jeff Breslau. “Even though we don’t anticipate high surge waves here, we don’t know for sure, so we’re just going to take precautionary measures,” Breslau said. “Now it’s just a matter of watching and waiting,” Breslau said. The magnitude 8.8 earthquake that struck off the coast of Chile early Saturday morning occurred along the same fault responsible for the biggest quake ever measured, a 1960 tremor that killed nearly 2,000 people in Chile and hundreds more across the Pacific. Both earthquakes took place along a fault zone where the Nazca tectonic plate, the section of the earth’s crust that lies under much of the Eastern Pacific Ocean south of the Equator, is sliding beneath another section, the South American plate. The two are converging at a rate of about three and a half inches a year. Earthquake experts said the strains built up by that movement, plus the stresses added along the fault zone by the 1960 quake, led to the rupture on Saturday along what is estimated to be about 400 miles of the zone. 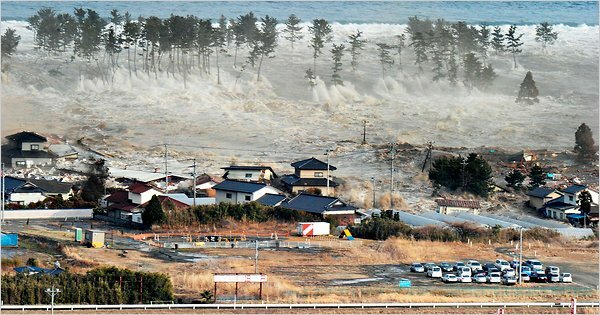 The quake generated a tsunami, with small waves forecast to hit the West Coast of the United States, and larger ones for Hawaii and elsewhere in the Pacific.